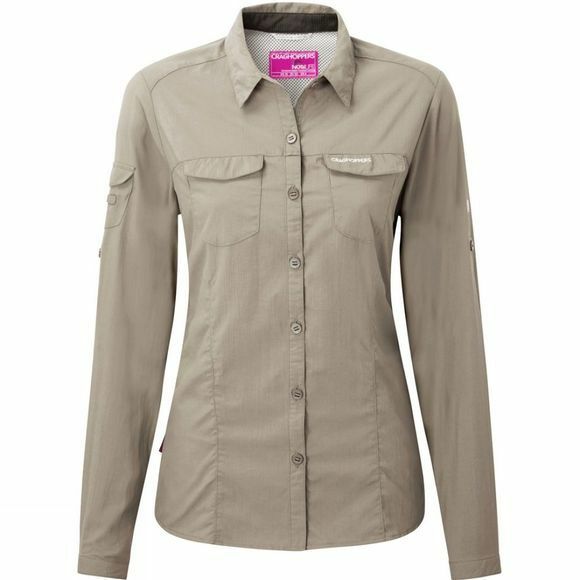 The Women's NosiLife Adventure Long Sleeve Shirt from Craghoppers is a classic travelling shirt that offers excellent versatility, protection and comfort. The NosiLife fabric helps to keep biting and stinging insects at bay while the SolarShield offers protection from harmful rays which is perfect when you are outdoors all day, everyday. The long sleeves can be rolled up and secured with a button tab when involved with hands on tasks while the ventilation at the back of the shirt along with the cooling collar will help to cool you down when exposed to intense heat. There are plenty of pockets to stash your essentials, including a discreet zipped pocket that is perfect for more important items such as cash or passports. The fabric is extremely quick drying and the drying loops make for easy hanging no matter where you are, perfect for rinsing through before you go to bed in full confidence it will be dry in the morning ready for another adventure.